The Northern Pacific Rattlesnake (Crotalus oreganus oreganus) is the only rattlesnake found in British Columbia and one of only three remaining rattlesnake species in all of Canada. The rattlesnake is a member of the pit viper family and although it is venomous, it is generally shy and non-aggressive. Rattlesnakes can grow to just over one meter in length, and can weigh up to about 900 grams. They range in colour from olive-green to tan, with dark blotches along their backs. The blotches turn into alternating dark and light bands near their tail, which ends in a rattle in adults. Rattlesnakes in BC are found in the province’s dry south-central interior valleys. They live in a variety of habitats, from open forests to riparian areas. Often you will find them among sage brush and antelope brush in shrub-steppe habitat. They overwinter in communal dens (often with other snake species) found in talus slopes and rock slides, which are usually south-west facing. They spend all winter in these dens, from approximately October to April. When they emerge in the Spring, they travel from their dens to well-used foraging grounds where they feed primarily on small mammals, before returning to den sites in the Fall. Pregnant females, however, remain close to their den site in areas known as ‘gestation sites’ or ‘rookeries’ for the entire summer, while they regulate their body temperature carefully and gestate their young. They mate in late summer, and do not give birth to their live young until the following Fall. These animals are extremely sensitive to human encroachment, and unfortunately experience the added pressure of road kill and direct persecution by humans. Rattlesnakes in BC are considered ‘threatened’ under federal legislation and are ‘Blue listed’ provincially. So remember, this snake is protected and it is illegal to harm, kill, or capture a rattlesnake in BC. The length of a rattlesnake’s rattle does NOT tell you how old the snake is. Rattlesnakes gain a new rattle segment each time they shed, which may occur more than once in a season, depending on how fast they grow. Baby rattlesnakes do not have a rattle. They are born with what is called a hard “button”. They begin to form their rattle as they grow and shed, forming a new rattle segment each time. Rattlesnakes have heat-sensing pits under their nostrils, which they use like binocular vision to locate warm-blooded prey. Rattlesnakes are ovoviviparous- meaning they hold their eggs internally and then give birth to live young. Rattlesnakes mate in late summer, but females do not give birth until the following fall. Females do not usually travel or hunt during this time, which means they can go over a year without eating! Due to how energetically costly this process is, females only mate every two to three years. Rattlesnakes in British Columbia can move relatively great distances over a summer. They have been documented up to four kilometers away from their den sites! The non-venomous Great Basin Gopher Snake (Pituophis catenifer deserticola) found in British Columbia is often mistaken for a rattlesnake, and vice versa. While there are fundamental physical differences between the two snake species, they may look similar to the untrained eye from a distance or when moving through vegetation. Below are some ways to differentiate the two snakes. Note that many juvenile snakes in BC also have blotches similar to a rattlesnake until they mature (e.g. Yellow Bellied Racer, Great Basin Gopher Snake, Western Terrestrial Garter Snake). Visit bcreptiles.ca/snakes to learn more. Although the two snakes have similar colouration, gopher snakes tend to be tan in colour (a cream-yellow to grey-yellow) with dark brown-black blotches. Rattlesnakes range in colour from olive-green to tan, with dark blotches along their backs. The blotches on a rattlesnake turn into alternating dark and light (often white) bands near their tail, which ends in a rattle. The blotches on a gopher snake appear to turn into bands towards the tail, but are not necessarily as distinctive as on a rattlesnake. In addition to square-like blotches along the spine, gopher snakes may have blotches along their sides as well. Gopher snakes have a black ‘mask’ on their face; the black band stretches across the eyes from each corner of the mouth. 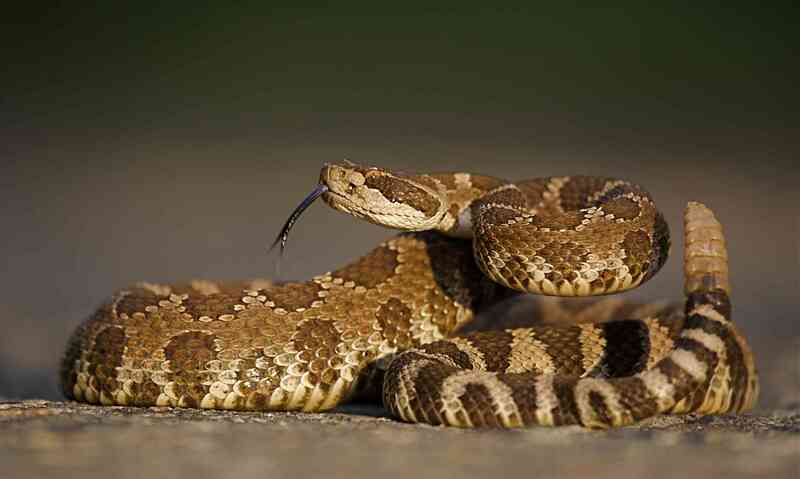 Rattlesnakes have a triangular-shaped head, which is distinct from their neck and the rest of their body. Gopher snakes have a sleek head that is the same width as their neck and their body gradually widens towards the middle of their body. A gopher snake will mimic a rattlesnake’s rattle when feeling threatened. By shaking and vibrating the end of its tail in leaves and dried vegetation, it may convince you it is a rattlesnake. A very scared and threatened gopher snake may also hiss and strike out. Bring the snake to the hospital. Snakes are protected by law and doctors do not need to identify a snake to treat snakebite in BC. You might not realize it, but there are many things around your home that may be attracting snakes. There are several things you can do to help keep your home and garden rattlesnake-free. Fill holes around your house and outbuildings with boards, steel wool or caulking. If you think a mouse can fit, it’s likely a snake can too. Remove snake-enticing rock piles. Piles of rocks, wood, or other materials provide convenient basking and retreat sites for snakes. Keep your yard free of cover objects. Close in decks and stairs. Use skirting so that snakes cannot access storage areas under decks and stairs where they feel safe. Keep your yard rodent-free. Spillage from bird feeders, pet food, and poorly managed garbage and compost can attract rodents, which are the primary prey of rattlesnakes. Remember that water features can attract snakes. Raised bird baths are preferred to ground level features. Consider installing snake barrier fencing around your home or parts of your yard. 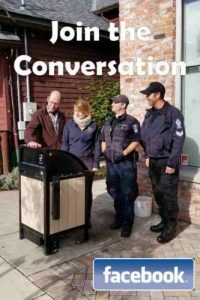 Contact a local WildSafeBC coordinator for more information on installation. Teach your children what a rattlesnake looks like and what the appropriate response is if they encounter one while enjoying the outdoors or playing in your backyard. If you live in a high-traffic zone for rattlesnake movement, it is highly recommended to install snake barrier fencing (see Fencing section). Make sure you regularly maintain your fencing and keep it clutter-free. Visit the Attractant section for some other actions you can do to protect your children around your home. Snakes are attracted to your yard for many of the same reasons other animals are (food, water, and shelter). If your child is bitten by a rattlesnake, get them to the hospital immediately. Although rattlesnake bites are rarely fatal, children and individuals with compromised immune systems are most at risk for complications. Snake fencing is an effective way to prevent snakes from entering your yard, but it must be constructed properly and maintained regularly. Below are some guidelines for building a snake fence. Contact WildSafeBC for more details and for help designing an effective snake barrier fence for your particular property. Use ¼”wire mesh fencing material. You MUST bury the fencing at least 6” (10 -12” is recommended) underground. This prevents snakes from using holes made by rodents burrowing under the fence, and allows for substrate erosion from rain and wind. The mesh wire must extend at least 2 feet above ground. You may attach the wire mesh material to existing fences, but it is often more effective to construct a new or stand-alone fence. Depending on the soil type found where you are building your fence, you can use posts and top-rails, or chain link fencing (with mesh wire attached). Either way, you will still need to dig a trench for the bottom of the mesh. 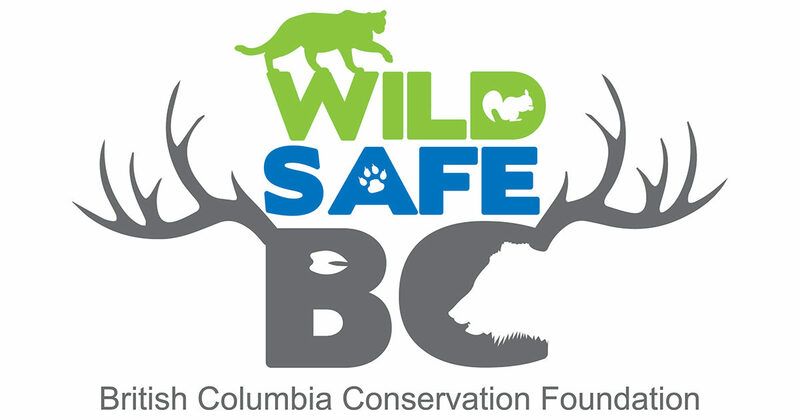 Contact WildSafeBC for detailed installation examples. If not already attached to an existing fence, the top of the mesh wire must be reinforced to prevent damage from passing animals or falling vegetation. Options include using rails, or additional strong smooth wire atop of the mesh fencing. In certain cases, you may need to install a gate for access, while still ensuring the continuation of the snake barrier fencing. Options for gates include framing mesh within a strong metal frame that slides into a channel or groove cut into a bottom rail (concrete or wooden post, partially buried underground). Modified cattle guards with snake exit ramps may be used for areas with high vehicle traffic. As snakes do occasionally find their way across fence lines (especially if you or your neighbours do not maintain your fences), you may install escape funnels. Funnels are made from the same material as the snake fence, and are small cone-shaped funnels, attached outwardly from the fence. The design of the funnel is such that snakes may exit from the interior of the fenced area, but are unlikely to enter (the funnel is installed so that the smaller opening is elevated from the ground, allowing snakes on the other side of the fence to pass along underneath). You may also attach a small, short section of fencing perpendicular to the inside of the fence line, in order to divert snakes into the funnel. Clear any weeds or shrubs along the fence line on both sides to prevent pile-ups of vegetation that snakes may use to climb over the fence. Inspect and repair any damage to your fencing each spring, before snakes make their movements from their dens. Monitor the fencing monthly for any wear and tear, erosion, holes, and/or vegetation pile-up. Rattlesnakes should ONLY be moved if they are a direct threat to you or your family. Phone the Conservation Officer Reporting Line at 1-877-952-7277 or your local Bylaw or Animal Control Office to arrange for someone to move the snake. Remember, rattlesnakes are protected and it is illegal to harm, kill, or capture a rattlesnake in BC. Maintain a buffer zone for people and pets. Wear appropriate clothing and footwear (long loose trousers and high-sided leather or rubber boots). Reduce the chance of the snake becoming alarmed, defensive, or aggressive (it will be much more difficult to capture). If you must leave to collect equipment, designate someone to keep an eye on the snake (and any members of the public) from a safe distance. A simple stick or broom can be used to move the snake. Sweep or prod the snake gently into a large open bin (such as an overturned garbage bin). Keep your hands OUT of the way of the opening and away from the snake. Replace the lid of the container, while keeping hands out of the way. Release the snake in an appropriate area IMMEDIATELY (into a covered area, with vegetation and shade). NEVER leave the snake unattended. Keep it in VIEW and in the SHADE. Snakes cannot regulate their own body temperature and overheat in direct sunlight very quickly. When releasing, carefully remove the lid, with hands and arms out of the way, place bin on its side and slowly tip snake out, or use long stick or broom handle to gently move the snake out. If you are close to the snake, remain still and allow the snake to calm down and back away. Once you are one snake body length away, step back and go around the snake. Do not expect all rattlesnakes to rattle at you. Their first response to disturbance is to stay camouflaged and hide. Their second response is to escape. They usually will only rattle when cornered, surprised, or when they feel very threatened. Striking is usually a last resort. Warning signs of a strike include a body in a coil, head slightly raised with the neck in an ‘s’ shaped curve, and rattling. Write up a workplace or work activity safety plan that everyone is familiar with. Find out the following information and distribute it to coworkers and staff. Carry it with you at all times. Do the local hospitals carry antivenom? There are many enjoyable hiking trails that happen to be in rattlesnake territory, but don’t worry; you can enjoy your hike safely by being observant and following some general tips. Use leather hiking boots with high sides that cover your ankles. If you’re a gardener living in rattlesnake country, there’s no need to worry. By managing your snake attractants, and installing snake fencing, you can safely enjoy gardening around your home. Below are a few tips for keeping your garden snake-free. For a full list of other snake attractants around your home, visit the Attractant section. Remove ornamental rock piles. Although those rock features may look attractive in your garden, they also look attractive to rattlesnakes. Piles of rocks or other materials provide convenient basking and retreat sites. Keep your garden rodent-free. Spillage from bird feeders and compost can attract rodents, which are the primary prey of rattlesnakes. Remember that water features can attract snakes, who need water just as other animals do. Raised bird baths are preferred to ground level features. Fill holes around the base of your greenhouses or gardening sheds with boards, steel wool, or caulking. If you think a mouse can fit, it’s likely a snake can too. Keep long grass trimmed, especially around the perimeter of your yard or garden. Remember to always be observant while working in your garden. Don’t sit down or put your hands down without inspecting the area first, especially when working in long grass or shrubbery. When pruning low shrubs and plants, wear leather gloves, and never put your hands where you can’t see them. Familiarize yourself with the identifying characteristics of both rattlesnakes and gopher snakes. Gopher snakes are found in the same areas as rattlesnakes, and are often mistaken for rattlesnakes. If your home is located in a high traffic area for snakes, it may be necessary to install snake barrier fencing around your garden or home. 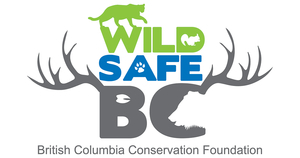 Visit the Fencing section or contact your local WildSafeBC Community Coordinator for detailed information on how to properly install the correct type of fencing. Please note, however, that although fencing is an effective way to prevent snakes from entering your garden, it must be constructed properly and maintained regularly. You should inspect the fencing every Spring, and on a regular basis throughout the year. Remove any built-up vegetation and keep on top of any needed repairs. If you find a rattlesnake in your garden, don’t panic. You can call the provincial Conservation Officer Reporting Line at 1-877-952-7277 or your local Bylaw Office for help and assistance. If you must move a rattlesnake out of your garden, there are several safety precautions you should take. Visit the Relocating a Rattlesnake section for instructions on how to safely move a snake and what equipment you can use. Remember, rattlesnakes are protected and it is illegal to harm, kill, or capture a rattlesnake in BC.